For those of us who lose items, Isdahl’s tale rings true. 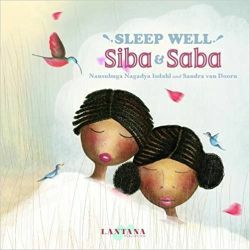 Siba and Saba are sisters living in Uganda. The story deals with geography of Uganda as well as numbers. The essence of the story is during your sleep, dream of your future and not on the losses of the past. This concept is appropriate for Ugandans who have endured much conflict over the years. The illustrator van Doorn uses visual humor to catch readers’ eyes. The birds flying across the page draw the reader into the story. The final illustration shows a sign post with many destinations. The hopes and fears presented in this book are similar for children around the world.